Weekly Associate Editor Linda Taaffe leads a discussion with reporters Sue Dremann and Elena Kadvany about the new book, "Bad Blood: Secrets and Lies In a Silicon Valley Startup," which unveils the alleged fraud by Theranos' former CEO Elizabeth Holmes and former COO Ramesh "Sunny" Balwani, who now face federal charges for an estimated $700 million investor fraud scheme. People are still somehow surprised that women can behave as badly as men. > People are still somehow surprised that women can behave as badly as men. Some women are even worse...this Holmes woman is a wretched soul & should be punished accordingly. No 'country club' prison sentences...instead, full restitution to all of the injured parties. And she can 'work it off' at minimum wage. 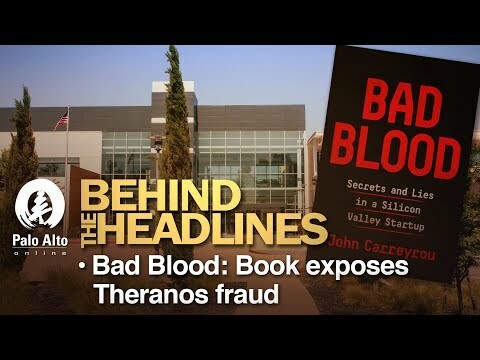 I have witnessed some cons in 25 years in high tech, and I'm still amazed at how easily people are scammed by a fast talker like Steve Jobs and the distaff version of Steve Jobs, Elizabeth Holmes. Of course, the 200+ blood tests performed by this whiz-bang machine was too good to be true, and it wasn't true. They even fell back on that old Silicon Valley ploy, the fake demo, to wow a credulous board of nincompoops that included George Schultz. If they can prove half of the charges against Elizabeth Holmes, she's going away for a long time. There's a reason the FDA has such a lengthy approval process for drugs and tests: people not only can not be made better, they can actually die as a result, But get government off the backs of the intrepid entrepreneur! Laetrile, here we come to a Walgreens nearest you! "If they can prove half of the charges against Elizabeth Holmes, she's going away for a long time." Or likely not. First, let's stipulate that if Holmes was a young black male caught possessing a couple grams of crack, she'd face long hard time. But she has multiple mitigating circumstances. First, this is a white collar crime, involving a lot of money. That brings a huge double discount. Second, she is white--an almost inestimable advantage. Unfortunately, being female, she loses the full extenuation package.